LG HS9 review | What Hi-Fi? Historically, LG’s soundbars have been thin affairs – in both style and sound. While they’re often space-efficient and unobtrusive, this has cost them points with performance. After all, the very point of a soundbar (or soundbase) is to bulk up a telly’s inherently thin sound and provide weight and substance. 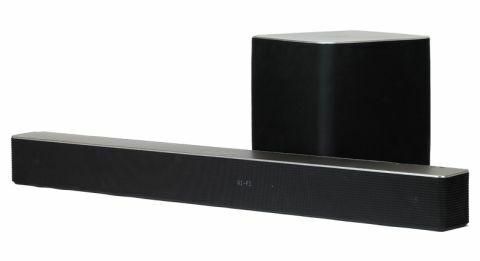 LG hasn’t held back with the HS9’s size – it’s a chunky unit around the length of a 50in TV, though only 14cm deep – so we’re hoping it has the big sound to match. You can wall-mount the HS9, but wherever you put it the universal appeal of its smart grille front and shiny silver top is bound to draw praise. LG has a reputation for attractive, modern designs and standards haven’t slipped here. A compact wireless subwoofer complements the bar’s seven drivers (each driven by an individual amplifier) and can be tucked somewhere out of sight. The rule is, the closer the sub is to the bar, the better the integration. It will connect to your TV via its optical and 3.5mm inputs or lone HDMI ARC output. Three HDMI inputs mean all your sources can be connected to (and controlled by) the soundbar as opposed to the TV, while a USB socket is purely for service. The HS9 is one of many products new to LG’s well-established Music Flow range this year. Essentially, being part of the family means it can connect to other Music Flow products – wireless speakers or a Blu-ray player – to work in a multi-room environment. Two of the range’s HS4 wireless speakers (£200 each) can also be used as surround channels with the HS9 to emulate a surround sound system. The Music Flow app holds your hand through any linking and syncing, and can also stand in for the neat, well-labelled remote by performing basic functions. Its attractive, user-friendly interface makes smartphone control a good option, although we were kicked out of the app a couple of times over our time with it. It also lets you stream songs from your device over wi-fi (or Bluetooth), as well as access the likes of Spotify, Napster, Deezer and TuneIn streaming services. Google Cast means you can cast music from compatible music apps like Google Play Music, TuneIn and Pandora to the HS9 too. File compatibility is good, with support for FLACs and WAVs up to 24bit/192kHz. All in all, this is one of the most fruitfully featured soundbars we’ve seen at any price. But does it break new ground with sound too? Even the priciest TVs on the market would benefit from the HS9’s clear, powerful and weighty qualities – not to mention its room-filling soundfield and decent scale. Strict tonal balance makes it all the more listenable as we sit down to Dawn of the Planet of the Apes, as does its composure as we push the volume to 11. Even in the densest action scenes, the LG sounds at ease. Mids find body and expression; the genetically modified apes’ voices are thick and heavy, while the desperation in Gary Oldman’s speech is effectively communicated. The bass, while deep, is a little flabby, not quite matching the Award-winning Yamaha YSP-2500 for tautness or punch as the score’s drums pound beneath the action. The HS9 can’t quite stamp the dynamic authority, or muster enough detail, to make the final human vs ape showdown as dramatic or involving as it should be – you can’t help but feel there’s more in the soundtrack than meets the ears. Subtlety isn’t its strong suit either: even slighter sound effects, such as the pattering of rain in the jungle, are a little too obvious. And while gunshots have clarity and punch, they sound more solid and crisp through the Yamaha. It seems LG can’t quite crack the soundbar market at whatever price point it enters. The HS9 may be attractively specified if you’re looking to buy into LG’s multi-room promise, but when it comes to all-important sound quality, it struggles to tick the myriad boxes you expect from an £800 soundbar. It’ll need a good price chop to warrant our earnest recommendation. The bottom line is that you can do better.